With the help of funding from the UK government, as well as donations from individuals, we are about to embark on a three-year project that aims to improve the sustainable livelihoods of 2000 smallholder farmers in Meru, Kenya. These farmers, the majority of whom are women, are mainly engaged in horticulture - growing vegetables in the fertile highland soil. I will explain how the project will work, but before getting into detail, it’s important to ask why we have decided to work with this group at all. 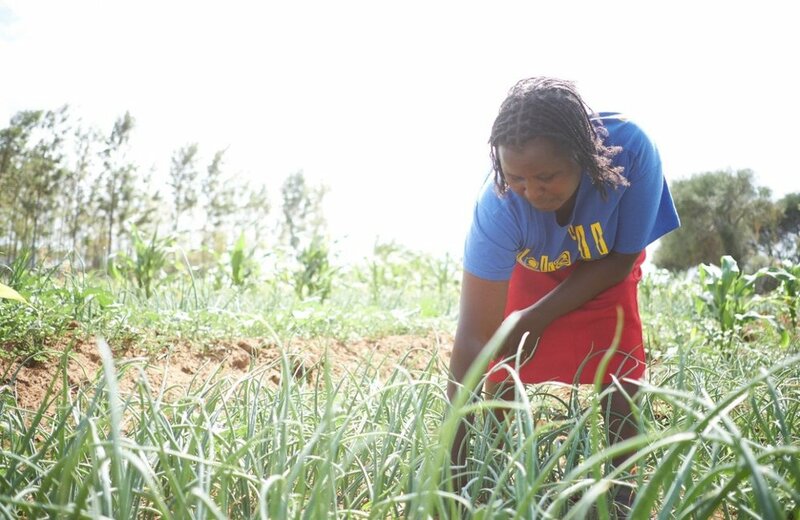 Why horticulture, why smallholders, why women? Horticulture is one of the leading sources of foreign exchange in Kenya (alongside tea and tourism) and horticulture exports generated more than £670 million of sales in 2015. The sector also employs approximately 8 million farmers and workers. Despite this contribution to Kenya’s economy, smallholder farmers and horticulture workers have not seen much in the way of profit. Dwarfed by the large processors, exporters and retailers that dominate the global vegetable sector, and without sufficient organisation, union support or negotiating capacity, they are largely powerless and unable to secure a good deal for their labour and produce. Working to redress that power dynamic has the potential to alleviate poverty on a wide scale in rural Kenya. Women represent 70% of the agricultural labour force in Africa, playing a huge but often unrecognized role in the production and sale of vegetables. However, their ability to realise their business potential is currently constrained by limited skills, access to services and resources, and discriminatory attitudes. Enabling women to become active entrepreneurs, even on a relatively micro level, will unleash huge economic and social benefits. It is for that reason that we are aiming for 75% of the farmers that we work with in this project to be women, and for this project to have a clear focus on increasing the visibility, voice, choice, and control of women in the vegetable value chain. This will mean delivering appropriate training, as well as creating the organisational structures that support women to be engaged in collective decision making. This is described in greater detail below. Chelagat Chemutai, 38, is one of the farmers we will be working with. As well as keeping dairy cows and farming maize for household consumption, Chelagat plants french beans to sell for export and onions for the domestic market. Her plot is rented, and her dream is to acquire her own land. Like many farmers in the region, selling french beans poses challenges for Chelagat. Buyers contract smallholder farmers to grow a certain amount, but often want less when it comes to the final sale, leaving farmers with a surplus that is difficult to sell on and will quickly spoil. Furthermore, vegetable export prices occasionally fluctuate and dip below the cost of production, exposing farmers to further loss. Part of the solution to this is crop diversification to lessen the risk of unexpectedly losing customers, or of sudden drops in export prices. Traidcraft Exchange and our partners will support Chelagat and other farmers like her to grow and sell alternative crops including carrots and potatoes. The selection of these crops will be informed by demand in both the export and domestic markets, as well as opportunities for increased productivity. However, to place smallholders in a position of greater strength within their supply chains requires more than just canny crop selection – it needs farmers to be organised so that they can leverage their collective power. This project will use an approach known as the Commercial Villages Model. This was developed by our partners Farm Concern International, and has been improved over the past decade based on the experience of using the model in eight different countries. The basic precept is that effective agricultural production, processing and marketing requires strong organisation. And a Commercial Villages Model achieves this by bringing together 100-250 households into an efficient and sustainable trading bloc which can achieve greater market power by investing in collective crop storage, coordinating market supply and building advantageous business partnerships with customers as well as businesses selling seeds and fertilisers. Traidcraft have always seen the value of using this style of approach – supporting the development of co-operatives, producer organisations and other similar structures. We are excited to see how Farm Concern’s model complements how we’ve done things in the past and are aiming to replicate the impressive commercial results that Farm Concern have achieved. The aim of this project is to increase the income of smallholder farmers. The average annual income of the households that we will work with is just £750, or £0.40 per person each day. We hope to increase this by 50%, and to pilot approaches to farming and business that will allow these communities to continue growing and trading their way out of poverty. We look forward to beginning to work with Chelagat, and others like her, and will share our progress.